Chef Michael Solomonov names the Israeli restaurants that inspired the food at his new Philadelphia restaurant, Zahav. Located just south of the Jaffa clock tower, this legendary bakery offers several dozen varieties of stuffed breads. 7 Yefet St., Jaffa. Run by the Abou Hassan family since 1966, this tiny hole-in-the-wall hummus shop is widely regarded as the best in Israel. The doors close when the hummus runs out. 1 Dolphin St., Jaffa. Spiced skewered meats from foie gras to lamb are the specialty of this old-school kebab house. 41 Etzel St., Hatikvah Quarter, Tel Aviv; 011-972-3-688-1034. 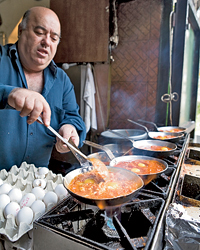 Many versions of the popular Israeli egg dish shakshuka are served in pans on communal tables. 3 Beit Eshel, Jaffa; 011-972-3-518-6560. The owner hand-grinds chickpeas in a mortar and pestle for each batch of the shop’s stellar hummus. Central market, Akko. 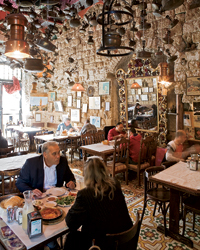 Solomonov’s father has been ordering the chicken shish kebabs at this restaurant for 42 years. 26 Rabbi Meir St., Tel Aviv; 011-972-3-517-9990.